History will record Syrian President Bashar al-Assad as "one of the worst tyrants of his era," says White House spokesman Jay Carney. The United States and other allies will maintain their support to the opposition, stressing Assad would be removed from power eventually, Carney said Tuesday during a media briefing. Q. Now that the deadlock has been broken in getting Syrian rebels the weapons, how quickly do you expect the weapons to get there? What impact do you expect them to have? Is there still time to stop Assad, who seems to be winning at this point? CARNEY: There is no question that Assad, with the support of Hezbollah and Iran, is continuing to wage a brutal assault on the Syrian people. And because of the support he’s gotten from other bad actors in the region, that assault has intensified. And that is why it is so important that the United States and our allies and our partners provide the assistance that the opposition needs to strengthen itself and so that it can withstand the Assad forces and the Hezbollah and Iranian-backed forces. Q. But are there any concerns that it’s coming too late, that Assad may just win the thing? CARNEY: Well, as I said the other day, Assad will never control Syria again, will never rule Syria again. And it is our firm position that the Syrian people will not allow, and we will not abide Assad as leader of Syria into the future. The transition has to be a post-Assad transition. And that is what we're working towards with the opposition, with our allies and partners in the region to help bring about that day when we can have a transition in place that can begin to rebuild Syria, that will bring about an end to the horror and the bloodshed, and can create an opportunity to transition to a government that is responsive to the will of the Syrian people. Q. …Administration officials have said the purpose of providing some assistance to rebels in Syria is to keep them alive and to keep them hanging on. Why would we help them do anything short of topple Assad? CARNEY: I'm not sure whom you're quoting. But the fact of the matter is the Syrian opposition needs the assistance that we're providing, and which many of our partners and allies are providing, in order to strengthen the cohesion of the opposition and to improve their circumstances as they deal with the assault that's being waged upon them by Assad’s forces. Q. Is the administration at a place where you'd see this as a slow bleed? 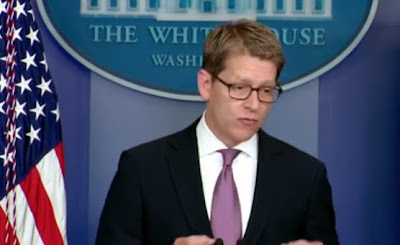 CARNEY: Look, I think that it's a challenging situation in Syria, which is why we have to provide this assistance. If you're asking me do we believe that Assad will prevail, the answer is no, he will not -- and not because we say so, but because the Syrian people will not stand for it. Q. But you're also acknowledging this isn't going to make him go. Q. I guess I'm asking, is the aid intended for the purpose of toppling him? CARNEY: The aid is intended to assist the opposition in its effort to resist Assad and to ultimately prevail over Assad and his forces. Q. Are you suggesting that the arms to the Syrian opposition will be decisive? CARNEY: I think I just answered that. I can’t predict into the future. I think the assistance the Syrian opposition is receiving comes from the United States as well as many other places, and that that assistance is provided and designed to assist the -- or help the opposition in its efforts against the horrific war being waged on the Syrian people by the Assad regime. We obviously support the Syrian opposition and support their efforts to combat Assad militarily, because that is necessary as we move to a point where a political transition can take place. And the brutality being engaged in by the Assad regime needs to be countered. And we are providing assistance for the Syrian opposition in their efforts to do that. Q. I know you can’t predict the outcome. But if it’s not decisive, will it escalate? CARNEY: Well, again, I can’t predict, but I can note and deduce from the way that we have steadily increased our assistance to the Syrian opposition, as that opposition has become more unified and strengthened, that the President’s commitment will continue. And he believes we need to continue to step up our assistance because of the imperative that Assad not be allowed to essentially murder an entire nation. Q. We are in this until he falls, in other words? CARNEY: Well, I think that the opposition -- it’s not us. We’re not alone here. We are supporting an opposition here, and we are supporting an opposition, together with many allies and partners who cannot abide what Assad has done in his country and to his people. There is broad international consensus with a very short list of holdouts when it comes to opposing Assad and insisting on his departure from the scene. Unfortunately, those holdouts have prevented the passage of United Nations Security Council resolutions, but they have not prevented us from working with other partners and allies in providing assistance to the Syrian opposition. Q. …You’ve said Assad will never rule Syria again, that he will not prevail. What is giving you that confidence? Because it seems like right now he does have the upper hand. Q. But I mean, what proof do you have? Q. But he seems to have the upper hand. CARNEY: Well, I’m not sure. There are ebbs and flows in conflicts like this. There is no question that with the assistance of Iran and Hezbollah, a couple of very bad actors -- notable friends, you might say, friends that say a lot about Assad in a situation like this -- he has inflicted even more harm on the Syrian people. And for that reason and others, it’s incumbent upon the United States and friends and allies who support the Syrian people in their battle against Bashar al-Assad to provide the assistance and the stepped-up assistance that we’re providing. Labels: Assad, Jay Carney, Syria, White House, White House says Assad is "one of the worst tyrants of his era"